We’ve only gone and done it again! We know the picture only has 2 cakes but... We actually won 3 awards - We have another old favorite waiting in the wings for Autumn! So, what are the winning cakes? 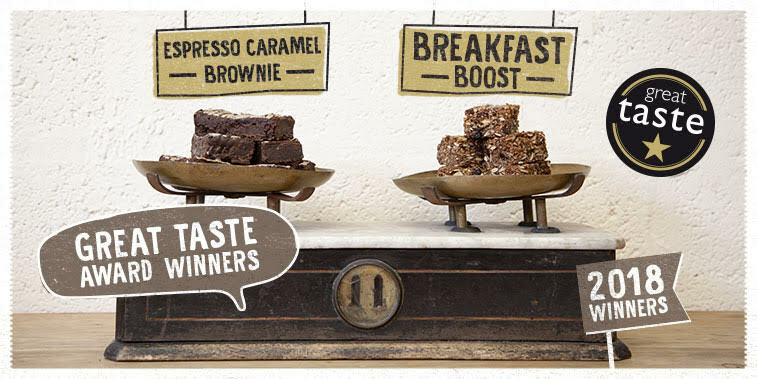 Here’s a brief overview of the winners… Espresso Caramel Brownie – yes, this handsome devil has wowed the judges with its ‘big hit of roast coffee flavour’. Originally invented for the Waterfall project back in March and debuted at the London Coffee Festival, this dense and gooey brownie seems to have won the hearts of not only the great taste judges, but our loyal customers too! We’re happy to let you know that this brownie won’t be going anywhere soon. Breakfast Boost – a newcomer at the beginning of the year, our breakfast boost bar brought home a prize at this year’s Great Taste Awards too. The judges loved the ‘great texture’ and ‘well-rounded flavour profile’. We love the fact that its packed full of goodness, a great source of fibre, NGCI, vegan AND made only using natural sugars. A wholesome pick-me-up at any time of the day! Mulled Apple TrayCAKE – We released this traycake last year for Autumn and it flew off the shelves. The feedback from our amazing customers was that good that we wondered if the Great Taste judges would agree. Lo and behold they did! They thought that it was a ‘deliciously rustic and wholesome looking cake’. They thought ‘the texture is wonderfully moist and the flavours are well balanced with spices, fruits and nuts’. Back at HQ we’ve decided that this cake’s coming back big style this year. We love it, you love it, and so do the Great Taste guys. See you in September! So, there we have it, another year of great taste, another set of awards. Did you know that we’ve won over 20 great taste awards over the years!? We love nothing more than making the most delicious cakes for our wonderful customers to sell in their shops, and nothing makes us prouder than getting great feedback.